Today, February 21, is Ben’s birthday. I’ve been suffering from vertigo and horrible back pain that I think is sciatica, so, physically, I am already feeling pretty lousy. This is another of the February milestone dates that I dread. It is the fourth birthday without him, and I can’t help but ask myself how many of his birthdays I am going to feel like this. The truth is that I have gotten used to the waves of sadness and loneliness. I didn’t know how I would feel today but I go with the flow of my emotions. I don’t convince myself that I have to be miserable, I don’t punish myself, and I don’t anticipate anything other than that I don’t know how I am going to feel and that I will be okay with whatever mood hits. The sadness and loneliness don’t paralyze me the way they did, but the bursts of tears remain. I miss Ben and I think that’s okay. I miss making a fuss on his birthday. When he was homebound, I decorated our apartment after I put him to bed so he would have a fun surprise in the morning. He knew I was decorating but never knew exactly what he would find, and that delighted him. I also looked at the video that I made on his birthday the first year I was without him, which I have placed here again. There are photos of his birthdays and other happy occasions, and, of course, some Walt Disney World photos. Some were taken when he had ALS and some in the pre-ALS days. The love was always there, so I embrace all of the memories. I guess it will always be jarring but sweet to hear The Beatles’, “Happy Birthday.” Ben woke me up with that song every year on my birthday. Now, I am playing it for him. I find it comforting to revisit beautiful memories. That doesn’t mean that it doesn’t come with tears, but tears are okay. So are smiles. This year, I’m fairly homebound given the way I’m feeling. That is certainly reminiscent of the way we celebrated Ben’s birthdays. This year, however, I have a new little baby. Having lost my sweet Disney, I brought home little Tinkerbell on Monday. The organization that rescued her listed her birthday as January 29, because that is the date that she was found. However, I gave her the birthday of February 18, which is the day I brought her home. It is my one happy February date amidst of several sad milestones. Tinkerbell is quite small. At two years old she weighs less than 8 pounds, so she’s almost fairy sized! 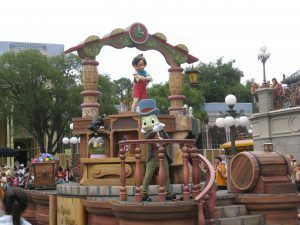 Disney, when she was healthy, weighed about 16 pounds and so did Tiffany. Tinkerbell is an affectionate, sweet little girl who follows me everywhere and within one night was already sleeping against my feet. She has a tiny little meow, too, that almost sounds like Tinker Bell’s jingle-talk! Although it’s barely two weeks since Disney went to be with Ben, I realize that I am at my best when I am taking care of someone, human or otherwise. Caregiving taught me that. In the moments, it was not always a lesson I wanted to learn. In fact, at times I resented it. Of course, I needed help so I was sometimes sinking in the tasks and emotions. But, as I have said before, caregiving was the most loving, meaningful and important work I have ever done. 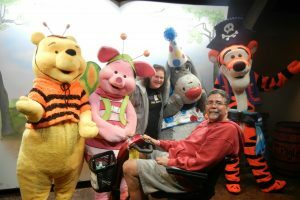 I continued it with Disney, as she got diagnosed with diabetes just after Ben left this world, and then continued to have more and more health challenges. I hope that Tinkerbell, or “Little Bell,” as I’ve been calling her, has a long and healthy life. She’s a wonderful joy in my life right now, and today I will talk to her about Ben. He would be very happy that I called her Tinkerbell (I spelled it a little differently). We loved Tink and the fairy films. We often watched them before we went to sleep. It always made me chuckle that he loved Pixie Hollow Games and would often watch it even when I was not home. Then, he would remind me that he was macho before he met me. 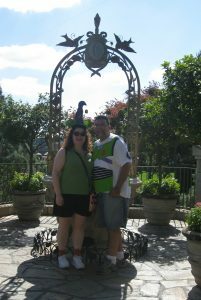 One of my favorite Tinker Bell related memories was from Walt Disney World. We met Tink and her friend Terrence in Pixie Hollow, where, of course, we were shrunken to pixie size. Terrence was so extravagantly in character, having particular fun because we were adults (well, technically- Ben probably would not have vouched for my maturity level!) and I couldn’t stop laughing. The photographer caught this photo of Ben laughing at me. It remains one of my very favorite photos of him, especially because it was when his ALS was progressing and we truly treasured the laughter. Today, I want to remember that laughter. 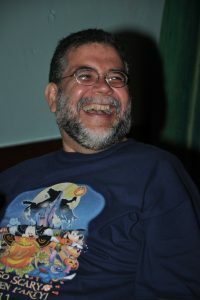 Ben laughing at me in Walt Disney World when we met Tinker Bell and Terrence. I will have my usual Disney movie marathon of Ben’s favorites- Monsters, Inc., Mulan, Toy Story (1,2,3) and The Incredibles. I will also show Tinkerbell the Tinker Bell films so she can see the feisty fairy for whom she is named. This year, my physical feelings happen to match my emotional tension, but I want anyone reading this to know that, at least in my opinion, there is no “right” way to deal with events like this. If I had felt like I did not want to do anything special for Ben’s birthday, and just share a quiet thought of him, that would have been fine, too. I feel no compulsion to defend myself. That, in itself, feels like progress! An important visit to the Wishing Well at Cinderella’s Castle that became a ritual- wishing for a cure for ALS. Halloween 2012. Eeyore’s wearing a birthday hat! 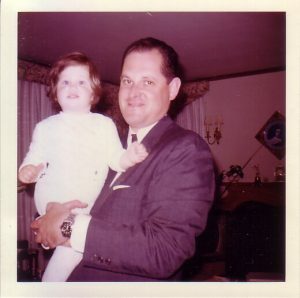 Today, February 15, would be my dad’s birthday. It’s a strange and melancholic kind of time, with the anniversary of his passing just two days ago and Valentine’s Day yesterday. But, there are so many good memories on which I try to dwell during these down days. 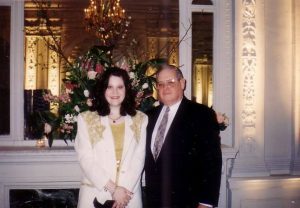 I was a Daddy’s girl and I was his life and his caregiver. 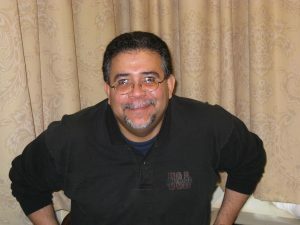 I wrote more about him a couple of days ago, on the fourth anniversary of his passing. Click here to read that post. 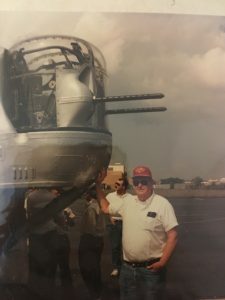 My dad is always in my heart and thoughts, and at this time I would like to take the opportunity to put him front and center and share glimpses of his life. My dad never wanted to make a fuss over his birthday. But, we always did. And he deserved it. I realized as I was preparing this video last year for his birthday that my dad was not in so many pictures because he was always the one taking the photographs. The background music is From The Hall of Montezuma, the USMC hymn. He would love that. 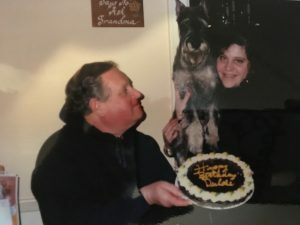 He loved dogs, the USMC and his family. The camouflage coat you will see was an homage to the USMC, and he liked telling people that he wore it when he went outside and tried to hide among the greens from his mother-in-law, my grandmother. I had to include it in the slide show. Who would have thought that my dad and Cinderella and I would have any connection? Well, we do. Cinderella and my dad share a birthday, since the movie Cinderella was released by Walt Disney Productions on this date in 1950. 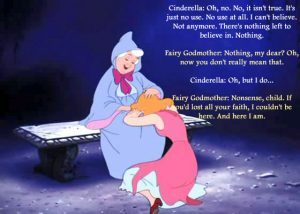 Cinderella was my favorite princess when I was a child. She remains dear to my heart because there is more to Cinderella than what meets the eye. She appears simply sweet and naïve, but she had feistiness and determination, and also a loyalty to her father’s memory to which I can wholly relate. It was very hard for her to lose both of her parents, but she let their lessons and moral compass guide her. That’s something I completely understand. Cinderella knew the importance of integrity and the power of dreams, and in the end, all of those qualities got her the love of the prince of her dreams and a position of respect! She knew at her core that, despite her stepmother and stepsisters treating her horribly, “They can’t order me to stop dreaming.” There’s a good life lesson. I know that people sometimes think I’m unrealistic because of my Disney love and its connection to wishing and dreaming. On the contrary, as the caregiver for my dad and for Ben, I was hit with harsh realities on a daily basis. Dreaming and wishing were my escape. They encouraged me to find creative ways to solve problems. And, they allowed me to envision a future where my dad and Ben had peace and comfort and I could stand alone and live happily with them in my heart. Now, as I work through grief, dreams help me to redefine myself and reshape my life. No one can tell me that dreams are not valuable and important. Maybe you don’t literally talk to your Fairy Godmother, but I imagine that a lot of readers have had a similar conversation with someone, or with themselves, and questioned their faith that they could handle things or that things would be okay. There is a song in Cinderella called, So This is Love. Though the song is about romantic love, the title is significant. When we are watching someone struggle with illness or we are struggling with caregiving responsibilities, we accept these challenges, and embrace them, because this is love. It’s that simple. And, that complicated. At the heart of the film is the song A Dream is a Wish Your Heart Makes. My dad called me his Private Benjamin, but I was also his Cinderella, and I will always keep his spirit alive and let him guide me. Happy Birthday, Daddy! I love and miss you! I always loved Valentine’s Day. I have hand-made Valentine cards for as long as I can remember. My great-aunts and great-uncles, and of course my parents, aunt and grandma, saved all of them. As they’ve passed on, their collections of the cards I made for them made their way back to me so I would know that they were kept and treasured. I see them as testaments to the love we all had for each other. But, I miss all of these people. Now, Valentine’s Day is bittersweet. 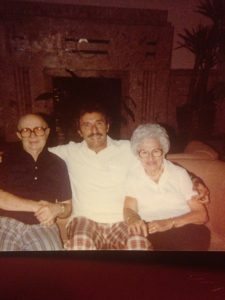 My dad passed away the day before Valentine’s Day in 2014. I spent Valentine’s Day that year making his funeral arrangements. My dad’s birthday is the day after Valentine’s Day. I remember the simple and sweet Valentine’s Days spent with Ben where we danced in the living room. Dancing was an important part of our relationship and I miss that, too. 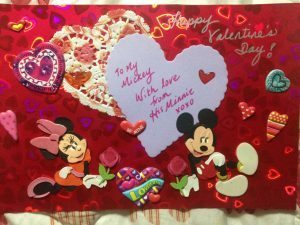 He always knew that after I put him to bed, I would make a card and decorate the apartment, and he looked forward to his Valentine’s Day surprise. It added some whimsy to his homebound life. 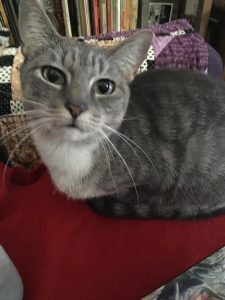 Last week, my cat, Disney, died. Valentine’s Day is now also the one week anniversary of that devastating event. There is certainly a melancholy that pervades these days. All of the people for whom I made my cards are gone, except for my aunt Eleanor, who is in a nursing home with Alzheimer’s Disease. She doesn’t remember the cards or me, and in more recent months she does not really relate to me or even notice my presence. 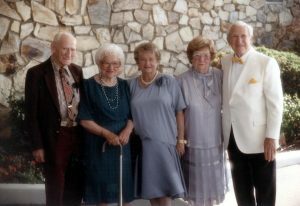 It seems an appropriate day to spotlight these people whom I miss and treasured so much. We all had a very special love for each other. 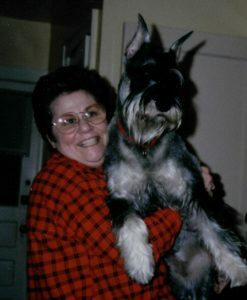 My mom and our Standard Schnauzer, Dulcie. Miss them both! 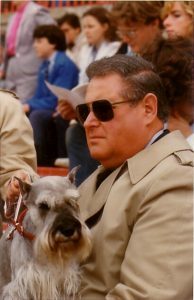 My dad, in one of his favorite photos, with our Miniature Schnauzer, Windy, at my Cornell graduation. Daddy liked to look serious, but he was quite the joker. Life has changed without all of these people, and although I lost many people that I loved and who loved me so much, I am fortunate and grateful to have had them in my life. I am also grateful to still be surrounded by much love. 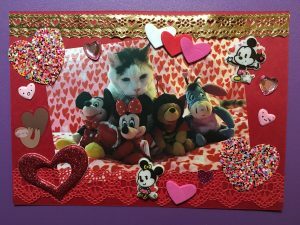 Crafts projects give me peace and inspiration, and I realized how important making Valentine cards was to me once I lost those closest to me. It was a way of showing and feeling so much love. I decided to continue to tap my inner child with my card-making tradition, giving them to special people in my life. Disney was the star of my cards. The weekend before I lost her, I took her Valentine’s Day photo. I suspected that it would be her last card because she has been so ill. I was not sure if I should send the cards, if they would make people sad or if they would find it strange. 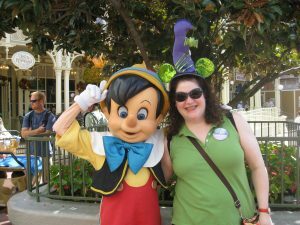 However, I decided that since Valentine’s Day is a day of love, I would share a special and loving memory of my sweet Disney. The holiday is different now, and, honestly, not as happy, but it does give me joy to show my love and appreciation for special people, in my craftsy way, and to share a special tradition that keeps Ben, my parents, grandma and great-aunts and great-uncles close. I wish everyone a Happy Valentine’s Day filled with love and friendship, and a sprinkling of pixie dust! One of the 2019 cards. Each one is different. Today marks 5 years since my dad, Jacob, left this world. People might think this strange, but I still think about him every single day, remembering his humor, his advice, his kindness and his history lessons. I think about how upset he would be about the state of our country and its leadership, or lack thereof. He was a proud Marine, and a real patriot. He also loved history, particularly WW2, and he would definitely be reminding me that history does indeed repeat itself. This is a difficult week because my dad died just two days before his birthday. I can’t help but relive the time he spent at the hospital and at the VA Hospice. I remember people from the staff telling me that I was my dad’s world. I did know that, and I am grateful that we took every opportunity to let each other know how much we loved each other way before he became ill. There were no things left unsaid. I am grateful to have had such a close relationship with him. I suppose the sharp pangs of grief and waves of sadness that permeate these days are testament to the love we had for each other. I like to think about it that way. Added to this year’s sadness is that I lost my sweet cat, Disney, just a few days ago, on February 7. I haven’t been able to commit that experience to writing yet, but I will say that she was a very brave, loving and lovable little girl. Her legs gave out and she developed a respiratory infection. 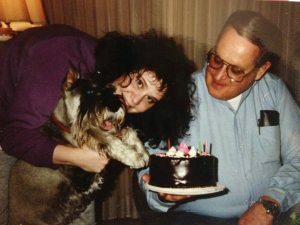 She was my last connection to Ben and she endeared herself to my dad, too. I like to think that she is walking comfortably with my dad and Ben. But, I am terribly lonely. There are so many times that I want to call my dad, to share a story, ask for his advice, hear him laugh. I still talk to him. Somehow, I know that he hears me, because sometimes he guides me to the answers. 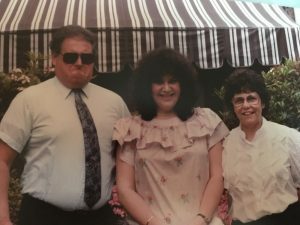 I wrote notes about my relationship with my dad for the Rabbi to present at his funeral. It has become my tradition to revisit those notes and I like to share them to let people know a little bit about him. Daddy would have said that he did not want any attention, but he deserves it. So hard to get him to pose seriously!